Fine Art Photography Prints by Ian Bramham: Ian Bramham - Introducing Myself! It's been a couple of years since I started this web site and I thought it was about time that I introduced myself properly! Also, when I look at other photographers web sites I really enjoy reading more about the story behind their photos so I thought I'd try and do that too in this and in future blog articles. My background is in architecture. When I was younger I spent 10 years training to get my professional qualifications and I've been working as an architect here in the north of England for the last 25 years - it's a profession that I love and that's what I do for a living but also, and more recently, I've developed a passion for fine art landscape and architectural photography. I've had a photoblog going since 2007 over at Aminus3 which I set up shortly after getting interested in fine art photography. Although I found photography enormously frustrating at the beginning, the great feedback that I got from other photographers there and at DPR and Flickr really helped me get over the initial steep learning curve to the point now where I feel that my photography is less about me and more about the subject of my photos and about the light and weather conditions at the time of taking the photo. After the intense frustration at my lack of ability in the early days I now feel much more at ease with my photography and I find it personally deeply rewarding, but it would never have happened without some very generous help and unstinting support from other photographers - in particular John Leech deserves a mention. He is a great photographer and a friend who is always willing to give honest and very perceptive artistic and photographic help and advice whenever needed. After a couple of years of posting daily photos on the photoblog at Aminus3 I started to get emails from people who had seen my photos there, asking if they could buy prints so I set up this website simply as a way of making the process easier and more streamlined. The photo at the top of the page is a snapshot from the summer of 2011 that my then 13 year old son Jack took of me with a camera phone when we were all on holiday together as a family in city centre Florence, Italy. 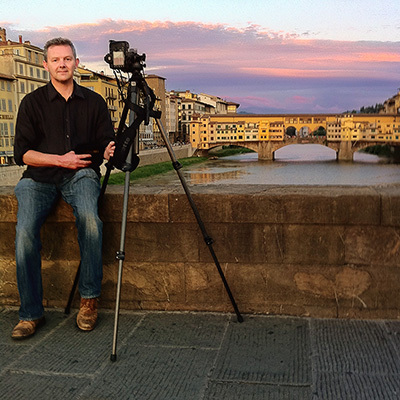 In the background is the wonderful medieval "Ponte Vecchio" ("Old Bridge" in Italian) and here you can see that the camera is all set on the tripod with everything ready waiting for the sunset. 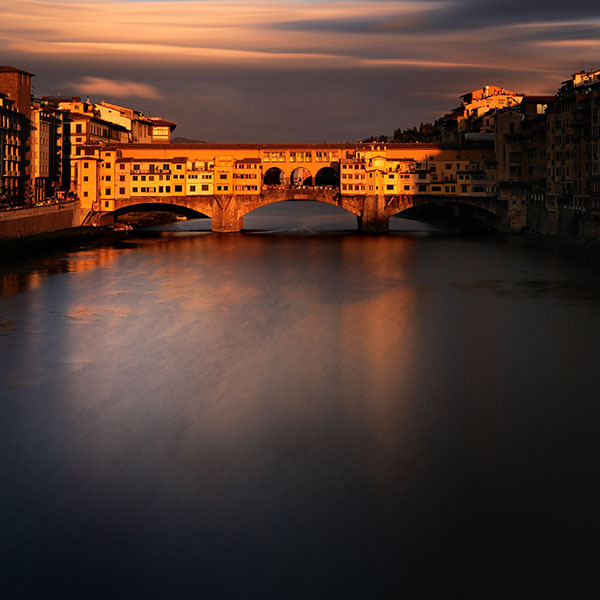 Dusk in Florence on the banks of the River Arno is absolutely spectacular! The sun sets along the axis of the river lighting the buildings and bridges in the most beautiful way imagineable! As dusk approached, the shadows grew darker and the colours intensified and I took a series of about 5 or 6 long-exposure photos using a programmeable timer plugged into the Nikon D700 camera that you can see on the tripod. I really enjoy taking long exposure photos as it offers plenty of time to enjoy the scenery and it slows down the photography so that I can spend more time thinking carefully about what I'm doing rather than just snapping away and hoping for the best. The downside is that it's a more complicated and deliberate form of photography and if you get things wrong on the technical side there's rarely the opportunity to retake the shot - especially around dusk and dawn when the quality of the light is changing so rapidly. The way that long exposure photography works is that you fix something called a "neutral density filter" onto the front of the camera lens. It's essentially a disc of dark glass which blocks some of the light from entering the camera so allowing a longer exposure time to be used - here I mainly wanted to use the longer exposure time to smooth out the rushing water of the river. Each photograph took several minutes for the camera to take the shot and process it. Even on the small LCD on the back of my camera I could see that one particular photo (the one just above) was better than the rest and I knew I'd caught something that I would be really happy with as a print - indeed it's now hanging on the wall at home next to the dining table in the kitchen as a 10" print in a square natural oak frame with a wide white mat. It has a small halogen light above it and the warmth of those sunset colours on the ancient stone of the bridge really glow! When I look at the print it also reminds me of a wonderful holiday with my wife and kids, the time we spent together in such a beautiful part of the world, and of the hour or so spent that evening with my son taking a few leisurely photos with plenty of time to talk and admire the wonderful scenery and atmosphere. "Your story is really inspiring Ian. I have been following your aminus3 blog and reading regularly articles that you post here. Thanks for posting your wonderful photos and insightful articles on photography. Thank you." "Hey, Ian. I just wanted to say Thank You for the inspiration and for continuing to enrich our lives with your Art. As you may know, I have been a follower of your work for a while now, and it's lovely to finally read the story behind the man. Wish you the best!